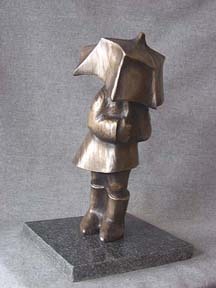 Digby Veevers-Carter came into the gallery in 2004 and remarked that he'd like to see the Umbrella Girl cast in Bronze. I said I'd love to see her in bronze, too. Then he told me he was a sculptor with a bronze foundry, and we made a deal. 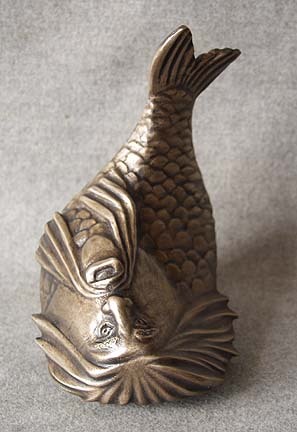 The Umbrella Girl was my first experience with a carving turned into bronze, and it can be habit-forming. Now I can't help envisioning my pieces cast, and that changes your attitude about shapes and surfaces. The Umbrella Girl was carved of oak, and the grain of the wood showed in the casting. 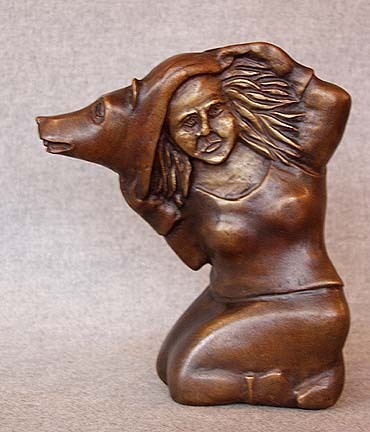 As soon as I carved "Unmasked" I knew that the bold lines of her hair would jump out in bronze. She was the second casting Jake (the mold-maker) and Digby did for me. The Tom O'Donovan saw the Alchemical Series I carved years ago, and wanted to show those pieces at Harbor Square Gallery. I've never wanted to part with those works, but we both were excited at trhe idea of showing them in bronze.